The winners—Pisa Ltd., Muuuse Ltd., Chan Kwong-cheung, Wong Man-chung (Hong Kong Design Institute), Mok Chin-man (Hong Kong Design Institute), and Lau Ka-yan (Hong Kong Design Institute)—took part in the competition as part of the Hong Kong International Lighting Fair (Spring Edition) 2014, held on April 6-9 at the Hong Kong Convention and Exhibition Center, and won for capturing “vibrancy of spring” with originality and functionality. The winning designs—Butterfly Love Blossom, Old Jeans New Lights, the Hanging Petals, Cohesion, Fresh Wind, and Glowing Tulip—were displayed in a dedicated section of the fair. 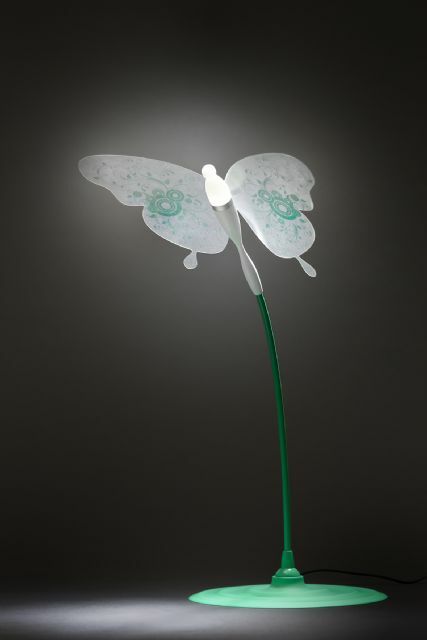 Description: A desk lamp with a butterfly on the arm and wings unfolding to symbolize spring. Using LED enables the lamp to be lighter and slimmer, also being suitable for most household interiors. The butterfly wings, made of “Shape-Memory Alloy, ” double as cooling element and unfold when the LED is on but fold upon power off. 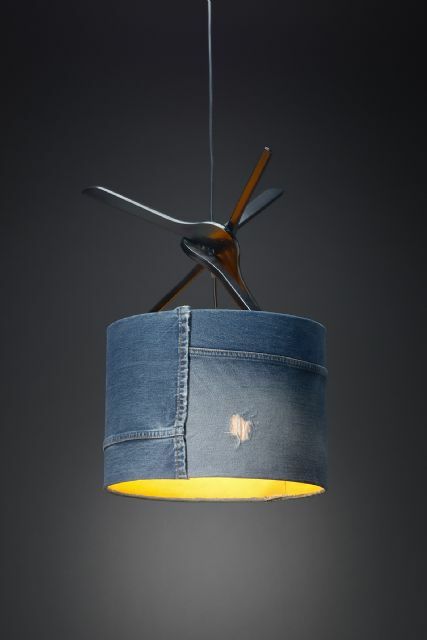 Description: Reanimation or rejuvenation is the concept behind the design of the pendant lamp, which uses recycled denim as lampshade and recycled hangers as mechanical structure, hence conveying youth and eco-friendliness. Also the concept enables physically and mentally challenged people to make living from making products with recycled materials and simple production process. Available in single or cluster type by hanging several single lamps at different height, this modern, eco-friendly design makes the lamp suitable for various places, especially schools as reminder eco- friendliness. 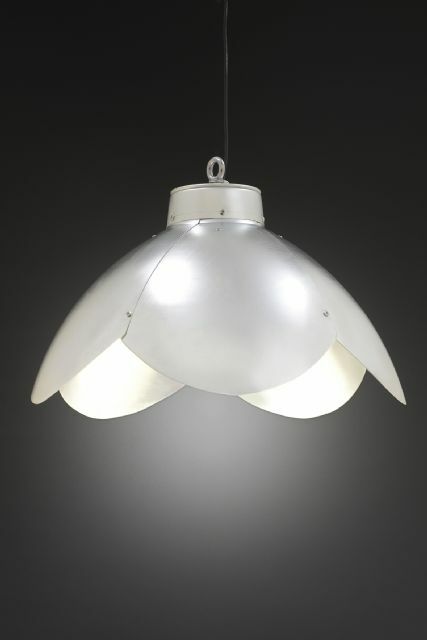 Description: A pendant lamp with floral petal-shaped lampshade that is extendable. Unfolding the petals expands the LED illumination area and vice versa. The petals act as physical support, heat sink, and reflector to reduce the number of parts and cost. The lamp provides dimming and color-temperature change without changing the existing single-pole switch mostly thanks to unique circuitry. 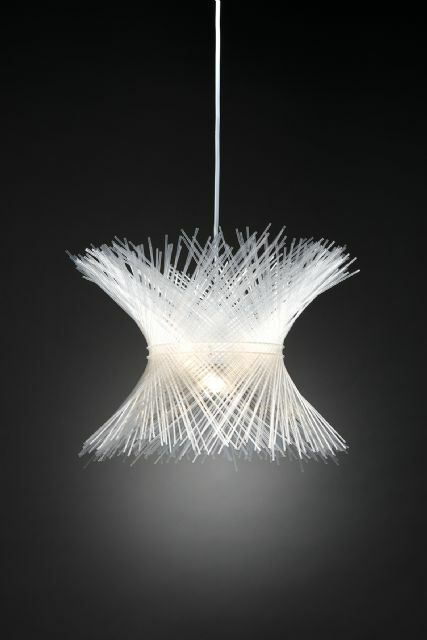 Description: The pendant lamp is unique for its lampshade assembled out of drinking straws. Its blossoming flower lampshade ensures smooth distribution of light. The design encourages family activity by allowing members to assemble straws into a lampshade. 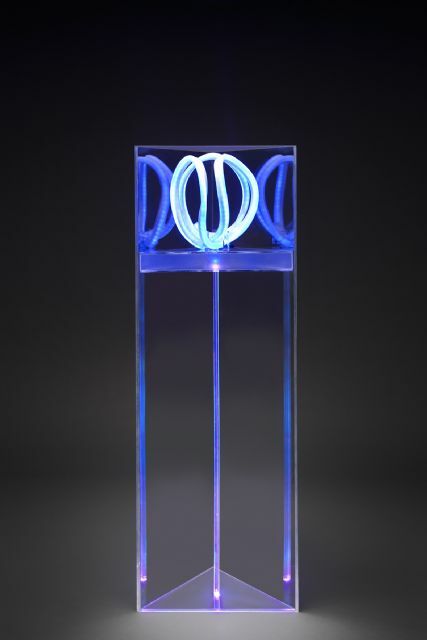 Choosing straws of their favorite color and weaving them into favorite style results in unique “Cohesion” lamps. 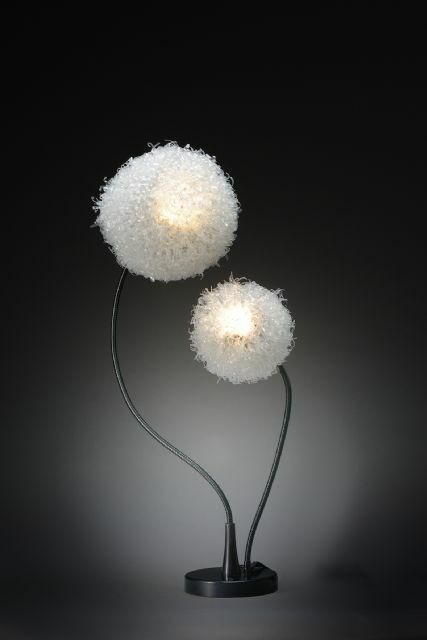 Description: This desk lamp is shaped like a dandelion, with two dandelion-like lights each sitting atop stem-like black arms, which are bendable to allow users to choose preferable angles. Description: This lamp is shaped like a tulip glowing in darkness, suggesting hope and opportunity during hardship. The design idea was inspired by a Song Dynasty poem called “Henbane”, which portrays the moon emerging from clouds and illuminating flower petals. The panel of seven judges included Mr. Antony Chan, Chairman of Hong Kong Interior Design Association; Ms. Ada Fung, JP and President of the Hong Kong Institute of Architects; Mr. Tino Kwan, Founder of Tinokwan Lighting Consultants Ltd.; Mr. Dennis Lau, JP and Chairman of the Association of Architectural Practices; Mr. Brian Lee, Vice President of Industrial Designers' Society of Hong Kong; Mr. Victor Ng, immediate past chairman of electronics division under the Hong Kong Institution of Engineers; and Mr. Winnif Pang, ex-chairman of Hong Kong Designers' Association. Fung stressed this design competition was important for the Hong Kong lighting industry and it had drawn attractive designs this year. "We have witnessed a high standard of design and creativity particularly among the entries of the Student Group. I really like the imagination of the participating students. They have come up with good design concepts although some of them need to be fine-tuned to enhance their marketability. Everything looks good from the use of materials to packaging and marketability," she commented. Lee noted this competition offered a wonderful opportunity especially for students to display talents, explore possibilities and gather experiences. Some contestants can really think out of the box. One of the entries uses vegetable fibre to make paper and then produce shades with special lighting effects. Another contestant also came up with a novel form and interesting composition using natural materials like wood and brass. It's great to see contestants come up with new lighting designs using various environmentally-friendly materials, said Lee. Pang noted that going green is definitely a major trend for lighting today as designers use more eco-friendly or recycled items such as bamboo fabric and biodegradable plastics to create stylish products. Some of the contestants in the Student Group this year have obviously adopted the green approach to increase the appeal of their works. This design competition provides a great opportunity for students in particular to learn from one another and stimulate better ideas.